At first glance it looks like the Octopus is simply out for a leisurely stroll; charming. When you look closer you see the Clownfish nestled in the anemone at the top; beautiful. Moving to the other side of the figure the narrative suddenly changes. 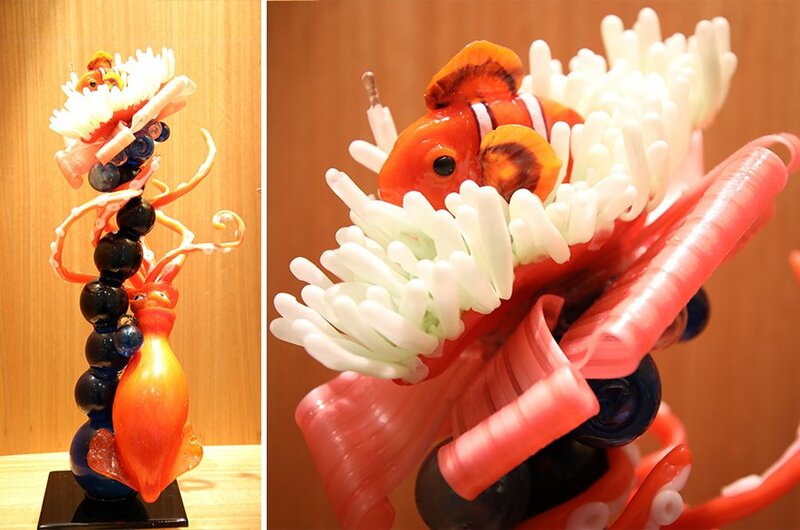 For Nemo fans it veers into a culinary horror story. The Octopus is eating a Clownfish starter. It’s not strolling. It’s stalking the main course – the second Clownfish tucked in the anemone. An avid recreational diver, Sébastien went diving in Bora Bora at Christmas followed by Rarotonga during Easter. 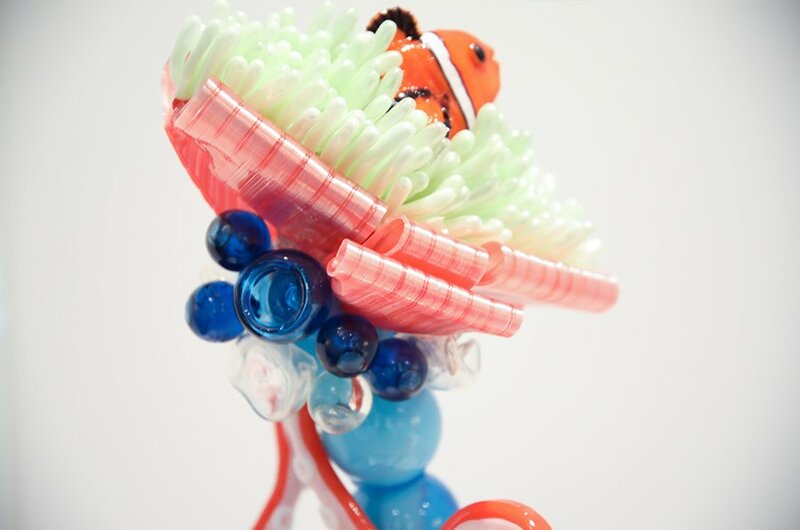 “Once I had the Nemo idea I started pinning photos of anemones, Clownfish and coral on Pinterest,” said Sébastien. The concept became a reality in early May when André Cointreau, President of Le Cordon Bleu visited the New Zealand campus. It took Sébastien about an hour to sketch the initial design and outline the workflow. The sculpture was made the following weekend. 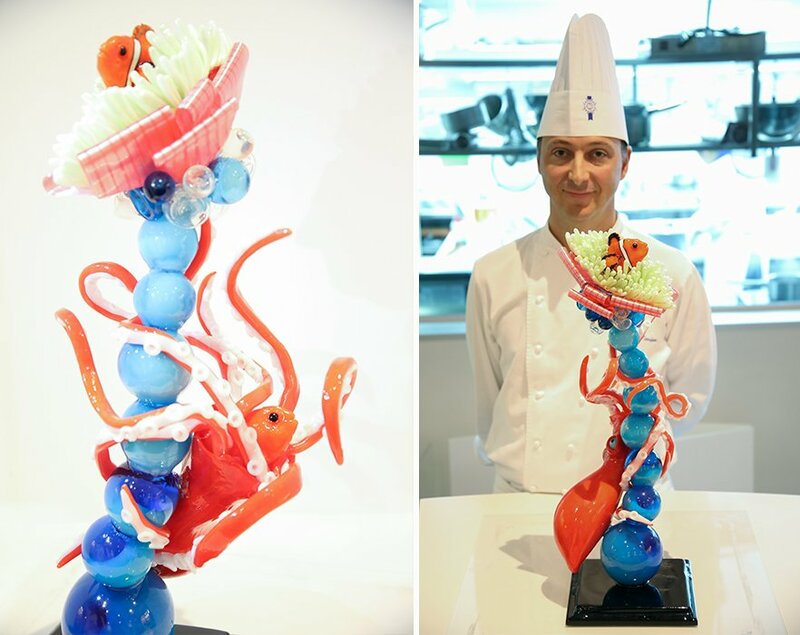 How do you create a sugar sculpture? “The first step is to turn off the climate control in the kitchen,” said Sébastien. “The hotter the kitchen, the easier it is to work with the sugar.” Next, a solution of caster sugar and water is brought to the boil. Using four classic techniques – casting, pulling, blowing and patinage – Chef Sébastien transformed the molten sugar into different shapes and textures. The sculpture’s heavy base, which looks like a black ceramic tile was made using the casting technique. With the base finished, he began the anemone and Clownfish. The former is made of over 200 tendrils. Each one individually made from pulled sugar tubes tinted a light green satin colour. Satin colours have an opalescent sheen. This distinctive shimmer and the minute variations in each tendril’s shape create the impression that the anemone is moving gently in the current. The Nemo “floating” inside the anemone heightens this impression. Made from three rectangular strips of coloured sugar it took about an hour to make the ribbon. Two strands had a satin pink finish and the third was clear pink. The strands were joined together to form a rectangular mass and then stretched by hand to about four times its length. The mass was then cut in half, joined together and then stretched again. This process was done four times. The end result was a sugar ribbon 10cm wide with 48 alternating strands of satin pink and clear pink. With the anemone finished he then constructed the central support, a sinuous curved column of seemingly transparent blue and white spheres. The translucency is an optical illusion created by the skilful application of layers of colour. “The more white the clearer the blue appears,” said Sébastien. This in turn creates a visual tunnel effect mimicking the structure of coral with water flowing through it. Despite their appearance, the spheres are not hollow. They are solid. Each bubble took several minutes to make. They vary in colour from dark blue to clear. Some are hollow and others are concave. The bubbles were made one by one using a mixture of two methods: casting and blowtorching. The blowtorch is used to create the concave bubbles. The flame heats the surface of the bubble. It collapses inwards creating the indent. If the bubble is too thick it won’t melt. So the casting needs to be hollow and thin. Subtly comedic this creature has the air of a bon vivant. It’s only upon closer inspection that its predatory nature is revealed. The Clownfish entrée it’s enjoying took about 30 minutes to make. The Octopus’s sinister, half lidded eyes were made from small white balls. A black iris was added. The eyeballs were then coated with a thin layer of blue and inserted into the creature’s mantle. The eight legs were made last; each one took about 20 minutes to make. Chef Sébastien began by making 150 suckers in varying sizes. “They need to be cold before they can be glued on, so I made them first. Want to become a Master Chef or hone your pâtisserie skills? The School also plans to launch a short master class in sugar work. For more information, subscribe to our newsletter. 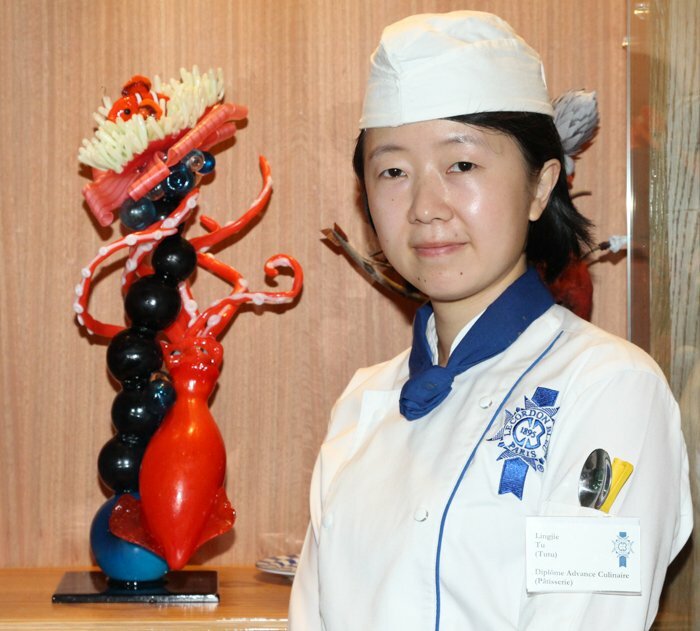 Advance Pâtisserie student Lingjie Tu (Tutu) watched Chef Sébastien make the Octopus showpiece. 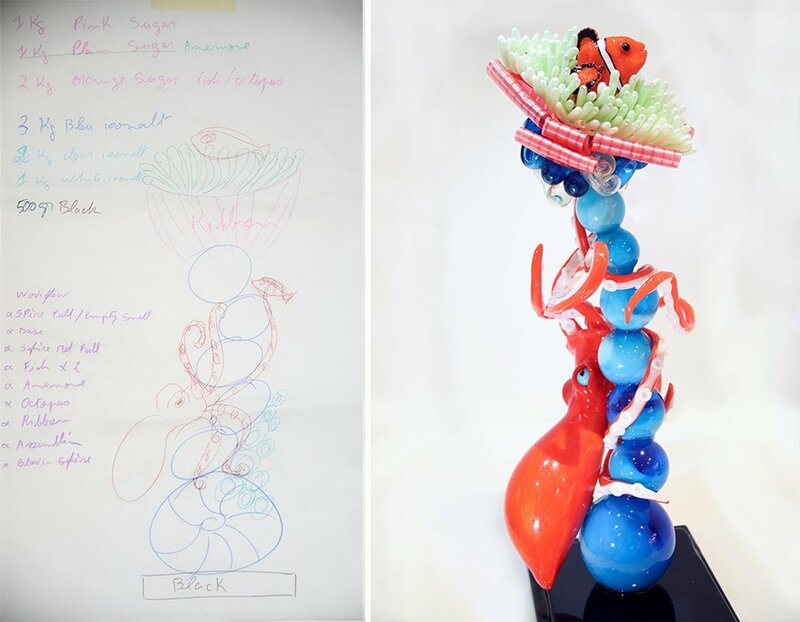 She enjoyed the process so much that he encouraged her to make her own sculpture. Instead of an Octopus Tutu made a Squid, a great choice. The fabled Giant Squid lives in the ocean off the coast of Kaikoura in the South Island. 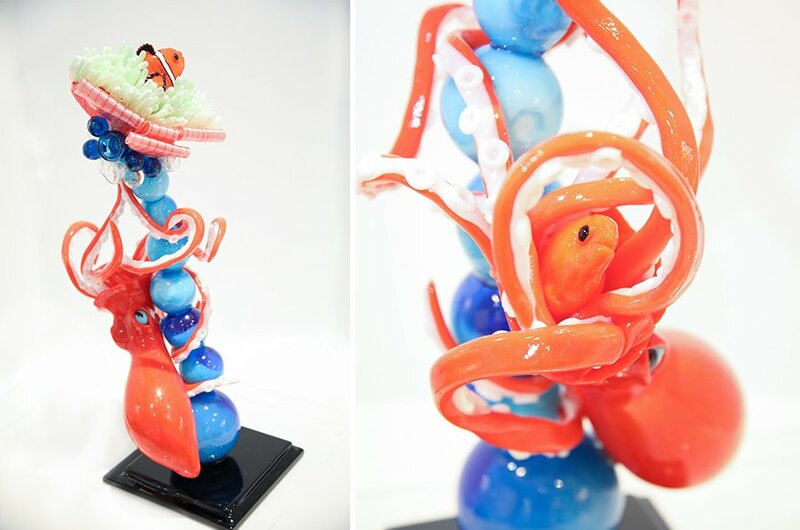 “I made the fish with the flower, squid, glued structure together, and Chef Sébastien provided me with the ribbon, and helped me through the entire process. “I really liked making the Squid,” she said. Its body was made from blown sugar. 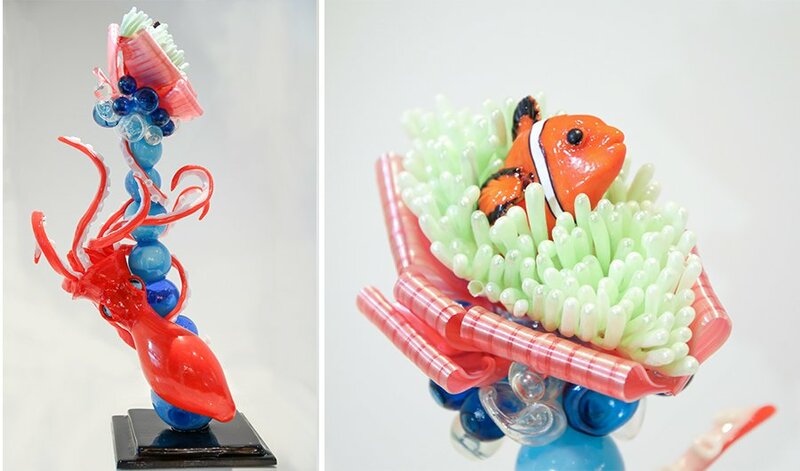 This technique is similar to glass blowing. Tutu inserted a blowing tube into a smooth, malleable ball of hot sugar. Then she blew gently into the tube to inflate the ball while rotating it to achieve the desired shape. The six legs took her about 3 to 4 hours to make. “I’m really pleased with how the showpiece turned out” she said.